The Gold to Silver Ratio is at a rare high of over 80. This ratio is the oldest continuously tracked exchange rate in history, it dates back to the Roman times when gold and silver were used as money and back then the ratio was just 12. The 12 relates to the number of ounces of silver needed to buy gold. The primary reason the ratio is followed is that gold and silver prices have such a well-established correlation. As we know gold is typically seen by investors as a flight to safety, so in times of economic trouble, the ratio increases as investors move out of other assets and into this rare and tangible asset. The chart below shows the ratio over 20 years from 1998 to 2018. 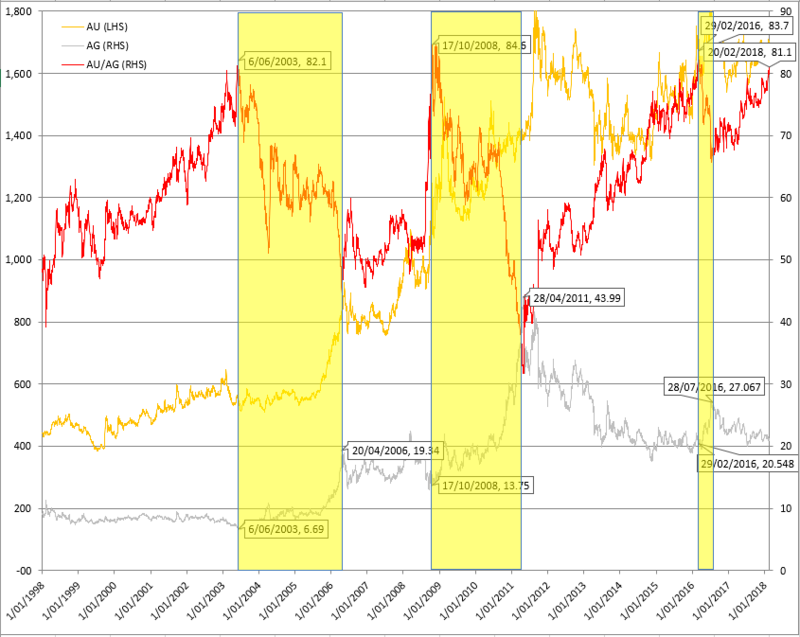 The red line is is the Gold/Silver (AU/AG) Ratio, the gold line is Gold (AU) and the silver line is Silver (AG). As at 20 February, the ratio was 81.1. Historically, the times it hit this level – 82.1 in 2003, 84.6 in 2008 and 83.7 in 2016 – it didn’t stay up there for very long and when it dropped it has usually resulted in a big jump in silver prices. As always, David breaks down each indicator backing them with facts and explanations. Whether you are an experienced investor or new to the precious metals game you will enjoy David’s point of view.